When our clients tell us about their wishes and dreams, we start to imagine right along with them. As we walk through their home for the first time, our heads are already spinning with ideas … we can picture the dog curled up on the rug, family movie nights lounging together on the sectional, and dinner parties in the dining room. We think about how we’ll feature their favorite paintings, where we’ll add built-ins to house their book collections, and how we can turn their dark, outdated bathroom into a light-filled master suite that feels just like their favorite vacation spa. We see their spaces with fresh eyes. As much as we’d love to say these things out loud and share our ideas with our clients, we actually keep all of our thoughts to ourselves. We want to carefully consider every detail and discuss as a team before we bring our ideas to the client. We want them to see it all together they way we see it. This is why we create our lifestyle boards. The lifestyle boards are how we communicate our overall vision to our clients. Before we talk about specific furniture pieces, fabrics, and colors, we want to make sure they share the same vision. 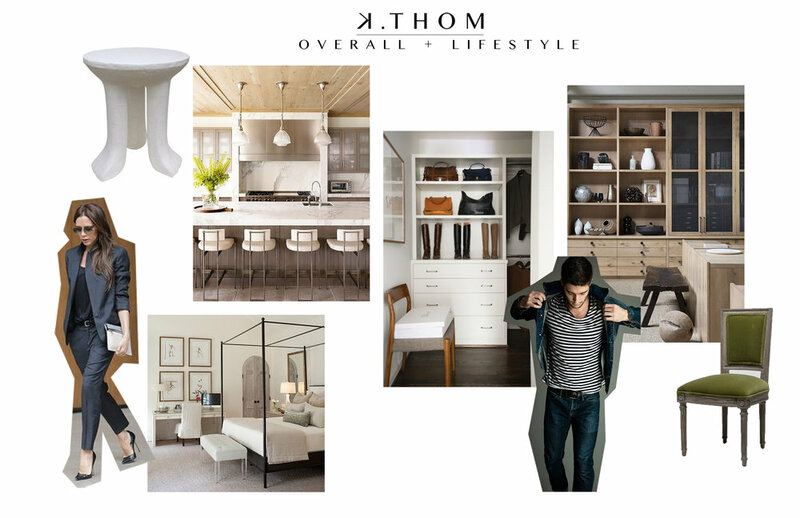 We create an “overall lifestyle” board to show how we picture them in their space. Here are some examples of lifestyle boards for client projects currently underway. The board above is for a couple who loves a monochromatic color palette with a tailored feel. They are crazy about their dog and want the space to feel cozy, comfortable and pet-friendly. They love to entertain and would like a mix of modern and antique pieces for a curated look and feel. This lifestyle board is for a family who loves neutral colors mixed with touches of blues and greens. They like natural materials and a clean, organized space. They are fashionable and sophisticated. They love to travel and have a lot of unique pieces to display. This lifestyle board is for a family who loves the California casual vibe. They like a clean, relaxed feel with lots of organic, natural finishes. They want to feel comfortable in their home for many years to come so we’re sourcing durable, substantial high-quality pieces that will stand the test of time.